Multiple crashes and whiteout conditions have forced authorities to close a number of roadways across the western half of Iowa. 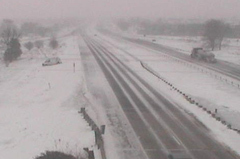 That includes Interstate 35 from north of Ames to near Mason City. A few inches of snow fell across the region this morning, but Iowa State Patrol Trooper Doug Cutts says the wind is causing bigger problems. “The snow’s kind of let up, but the wind’s still blowing and that’s really making visibility at zero,” Cutts told Radio Iowa. “Once you get away from the city, it’s hard to see anything out there.” Sustained winds are above 30 miles per hour with gusts ranging between 45 and 55 miles per hour. Motorists are dealing with zero visibility and slick roads. Cutts says the blowing snow becomes stuck to the pavement, which looks dry but is actually a glaze of ice. The Iowa Department of Transportation has pulled its snowplows off of some roadways in northern Iowa because of the unsafe conditions. Cutts says plows that are on the roads aren’t able to make much progress. “The sand, the salt…as soon as they put it down, the wind just takes it and blows it into the ditch,” Cutts said. “We’re just going to have to wait until the winds die down and conditions improve.” Travel across much of central, north central and western Iowa is not advised. Cutts says motorists who end up in a ditch could be there for several hours. The state patrol says one person was killed in a 20-plus car pileup near Latimer on Interstate 35 No other details about the accident were available at this time. A Blizzard Warning covers most of western Iowa through midnight while a Winter Weather Advisory is posted for much of eastern and southern Iowa. Find weather updates on the National Weather Service website.